This hillside home features stone, stucco and cedar shake shingles to complement natural surroundings and a walkout basement to conform with sloping lots. The home's most often used rooms are oriented at the rear of the home to take advantage of backyard views. A cathedral ceiling caps the great room, while the dining room and master bedroom are topped by tray ceilings. Built-in shelves border the fireplace in the great room, which, along with the breakfast room and master bedroom, accesses the splendid back porch. 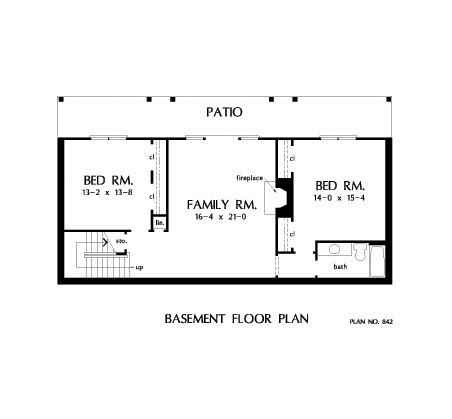 Located on the main floor, the master suite enjoys a walk-in closet, shelving for linen, and a generous bath, while the basement floor contains a full bath and two family bedrooms, divided by a comfortable family room. 1st Floor: 1769 Sq. Ft.
Other Storage: 19 Sq. 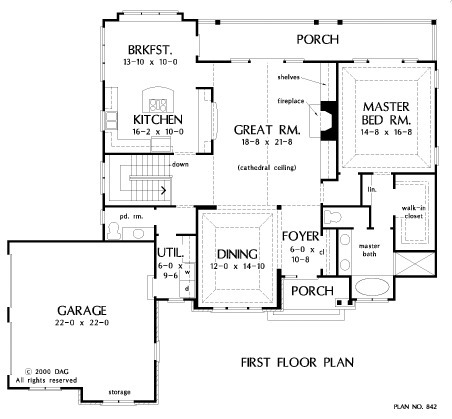 Ft.
House Dimensions: 65' 4" x 59' 4"
Great Room: 18' 8" x 21' 8"
Master Bedroom: 14' 8" x 16' 8"
Foyer : 6' 0" x 10' 8" x 9' 0"
Dining Room (Tray): 12' 0" x 14' 10" x 11' 0"
Great Room (Cathedral): 18' 8" x 21' 8" x 19' 6"
Kitchen : 16' 2" x 10' 0" x 9' 0"
Breakfast Room : 13' 10" x 10' 0" x 9' 0"
Utility Room : 6' 0" x 9' 6" x 9' 0"
Garage Storage : 10' 10" x 2' 0" x 0' 0"
Master Bedroom (Tray): 14' 8" x 16' 8" x 11' 0"
Bedroom #2 : 13' 2" x 13' 8" x 9' 5"
Bedroom #3 : 14' 0" x 15' 4" x 9' 5"
Porch - Front : 10' 4" x 4' 10" x 0' 0"
Porch - Rear : 36' 4" x 6' 4" x 0' 0"
Deck / Patio : 50' 10" x 6' 4" x 0' 0"
Storage (Other) (Clipped): 5' 10" x 3' 2" x 0' 0"
Other : 16' 4" x 21' 0" x 9' 5"